The Thousand Pillar Temple with its ruins lies in the near the Hanamkonda-Warangal highway, about 150 kilometers from Hyderabad city. This temple is a beautiful star shaped with several shrines and lingams. There are three shrines inside the temple called the Trikutalayam. The three shrines of the Thousand Pillar Temple are dedicated to Lord Shiva, Lord Vishnu and Lord Surya. The Thousand Pillar Temple is surrounded by a big garden in which many small lingam shrines can be seen. Further there are 1000 richly carved pillars with an impressive Nandi bull in the temple. Nandi bull was carved out of a black basalt monolith polished carefully to give it a brilliant look. The Thousand Pillar Temple is constructed on a platform that is raised to 1 meter height from the ground level. The Thousand Pillar temple is provided with a number of pillars which are beautifully carved and adorned. Delicate stone work which definitely adds charm and beauty to this Thousand Pillar Temple. Rock cut elephants and perforated screens in the temple which are the characteristic of the then prevailing dynasty. The Thousand Pillar Temple is one of the very old temples of south India built by the Kakatiyas of Chalukya dynasty. It is believed that the marvelous thousand pillared temple was built by King Rudra Deva in 1163 AD. It was destroyed by the Mughal Empires during their invasion of South India. It comprises one temple and other building. There are one thousand pillars in the building and the temple, but one pillar will not obstruct another from any point of the temple to see the god in the other temple. The 2.5 metres tall bronze image of Lord Chandranatha Swami in the sanctum of this basadi is considered to be very sacred. This three storied construction was supported by the rulers, the Jain Bhattaraka Swamiji, merchants and the common people. 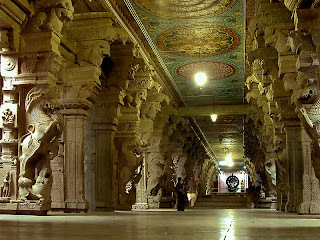 The temple is famous for the open pillared hall in front, consisting by a large variety of ornate pillars decorated with carvings typical of Vijayanagara style. A 15-meter tall single stone pillar called manastambha stands in front of the basadi. The present day engineers have taken out all the pillars from the building to make it in to a perfect shape. After they lifted all the pillars they encountered a huge mass of sand. It took nearly two weeks for them to take away all the sand. It was wet sand, it is always wet because there is pipe connection directly from the nearby water body named Bhadrakali Cheruvu. It was one of the master piece in Civil Engineering.